Surrounded by orchards heavy with pears and apples, Standish's tasting room was located inside what looked like an old mill. 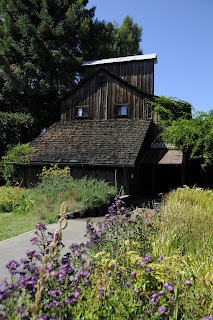 We spent quite some time just walking around the grounds, sitting beneath willow trees, and exploring the old tools and signs stored beneath the second story tasting-room. Once inside, the room had a feeling of rustic California: everything was composed of bone-dry, dark wood and rusted tools hung on the walls. Standish has a lot of wines to try and most are quite pricey. The wife of Standish's winemaker had recently tried her hand at the art for the first time: a rosé produced using the saignée method of fermentation. This French technique is the most common technique for producing rosés. It involves draining or bleeding the juice from the grape shortly after the grapes are crushed and the skins broken. This way the juice has only a slightly red coloring to it. The juice is then chilled and fermented at around fifty-eight degrees. The process allows winemakers to retain the bright flavors inherent to the fruit without making a wine dark in color. During our tasting, we tried one Pinot Noir twice: once in a small, white wine glass, and once in a glass designed for Pinot Noir. The difference was clear as day: the smaller glass did not allow the bright, round fruit of the Pinot Noir to come out as clearly, giving the wine a tighter character overall. If you haven't already, I highly suggest comparing wine-glasses for yourself to see how profoundly different the tasting-experience is. Before we left, the lady behind the bar told us to pick all the pears and apples we wanted, so we gathered a couple arm-loads. Today, we are actually cooking up another appple/pear-pancake (see "The Ultimate Brunch" below) thanks to Standish Winery! 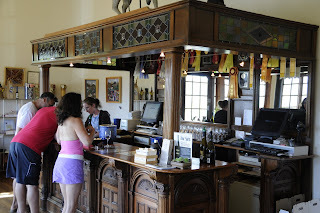 Husch is one of the better known wineries in the valley, and their inexpensive Pinot Blanc and Mojo Red are often the table wines offered in local restaurants. The caliber of their wines certainly goes beyond these wines. 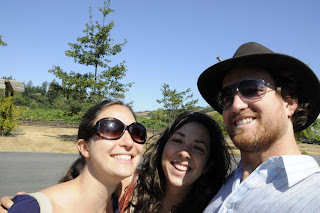 Their tasting room was a bit cramped due to their popularity, but we got to try a wonderful Gewürztraminer, who's residual sugars I've noticed, have seemed to lessen with each year's production, and a very fine Late Harvest Gewürztraminer. The only wine that I didn't like was the Reserve Cabernet Sauvignon, which had a very barn-yardy aroma. However, with Anderson Valley's cool temperatures resulting in wine with high acidity, the Cabernet might change considerably with extended aging. Milla Handley's wines were our last stop of the day. 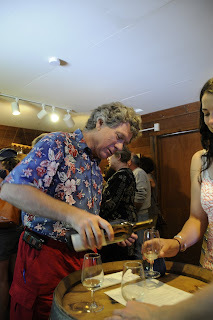 Milla was one of the first female winemakers in California, and started producing wine's under her own name in 1982. I enjoyed most of them, but my taste-buds were a little blitzed by that point and so we headed back to our campsite. That evening we drank a bottle of the Bliss Chardonnay from Brutocao and a bottle of Husch's Pinot Blanc beside a campfire while the locals down at the end of the campground played Bob Marley and laughed loudly. It was shaping up to be quite a weekend. Would we decide to spend another night in the land of plenty? Or would we just pack up and go back to San Francisco to take care of all those pressing responsibilities?